One of the first questions a new visitor to Moscow asks is how to get from the airport to other parts of the city. There are three international airports in Moscow, Sheremetyevo (SVO), Domodedovo (DME), and Vnukovo (VKO) serving millions of passengers every month. We recommend the “red train” which is the AeroExpress. Sheremetyevo is about 35 minutes from the Belorusskaya station in Moscow on the AeroExpress. Domodedovo Airport via AeroExpress is about 45 minutes from Moscow’s Paveletsky Rail station. Vnukovo airport is 35 minutes from Kievskiy railway terminal in central Moscow via the AeroExpress. Using the AeroExpress is very convenient and inexpensive. It allows you to stow luggage near you in the cabin and the seating is very comfortable. A beverage and food cart comes through during the trip, or you can carry on beverages and light food in the cabin. Taxi fares are often quoted in Euros or Dollars to foreign arrivals, but officially the fare is supposed to be paid in Rubles. Drivers will argue that they are ferrying riders from the airports who have no rubles on them, but in reality as you say, Jone, they’d love to have either dollars or euros. There is a taxi desk at each airport, but sometimes the representatives do not speak English. The rates when approached by drivers are negotiable and the quickest way to get a better price is to refuse an offer. If you really want a good deal, arrive late at night or in the wee hours of the morning when the pace of arriving flights is slow. However the best way to get a good rate is to make pre-arrangements. Moscow taxis generally organize their rates much like airline seats: Executive/Comfort or Economy. That means that the type of car will vary depending on your class of service. You pay more to ride in a Mercedes/BMW than in a Ford/Lada. Most cab companies charge between $30 and $60 dollars from any airport to the centre (anywhere within the ring road). That will vary depending on whether one rides Economy or Executive. If you request a hard to find apartment address, and a massive city like Moscow has plenty of those, expect to be charged an additional $10 to $15 dollars per hour extra once you’ve reached the centre, for example. Driving from one airport to another (they are not close to each other) seems to be from $70 to $100. Taxi companies and drivers at the airports are checked frequently, and thus the old days of nabbing a “gypsy taxi” at your airport is pretty much a distant memory. Triumphal Arch near Victory Park on Kutuzovsky Avenue. http://angel-taxi.com/transfers-from-moscow-airports/ Angel taxi usually has very low rates and does not charge extra for traffic jams which are common in peak hours. Tel: 7 495 956 08 00 Up to one hour waiting time for your flight to arrive is included, and the driver holds a sign with your name at no extra fee. https://lingotaxi.com/moscow-airport-taxi-transfer/ (they pride themselves on having only English speaking airport drivers). They offer 3 classes of service: Executive, Comfort, and Economy. Lingo Taxi has a phone number 7 495 204 21 34 but they offer online chat operators who speak English and that is easier for most travelers. https://easy2airport.com/ 24 hour service with 24 hour dispatch: Tel7 495 255 18 30 All drivers speak English and one hour waiting time is included, as is a sign with your name on arrival. – Your class of service (Executive or Economy) may be changed depending on how much luggage you bring. When I first moved to Moscow, I had something like 9 suitcases on my arrival flight. Most travelers are not moving there, but if you have lots of bags, you will be charged for the size of car (or minivan) needed. – Some cab companies will have the driver wait in the terminal holding a sign with your name. Some include that service, others charge extra. Know what services you will receive, and at what cost, before ordering. – Every car, including taxis, that enters the terminal areas of a Moscow airport pays a fee to exit. Make sure to find out if that fee is included with your reservation, how much it will be (fee is based on time) in order to avoid an unexpected charge. 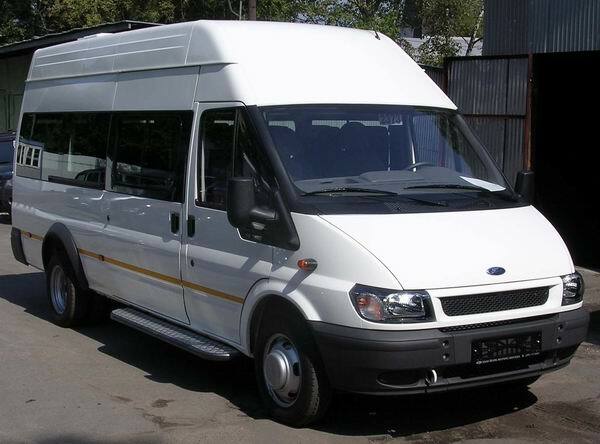 – Most cab companies, but not all, will give you an arrival window from one to two hours depending on the contract rate. This is good if your flight is late arriving. Ask about the fee before booking. Some cabs charge 15 to 25 rubles (.25 to .30 cents) per minute for waiting, but when it reaches 950 rubles ($13.50) the rate is capped by most services. Even if not capped, that is only about $15 for an hour. – Some cab companies, but not all, charge to assist with carrying your luggage. That averages about 300 rubles ($4 USD). No biggie in my estimation, and sometimes when tipping the driver that will be dropped from the expected fee. While all the above are reputable, we appreciate Angel Taxi. Not only are they typically among the lowest in overall cost, this company channels a percentage of their profits to Angel Charities which includes financial support for special cases at Children’s Clinical Hospital, and a school for special needs children at the Bogorodsk Cathedral. There is no link between Angel Taxi and the Mendeleyev Journal. We like how they operate, and that they give back even during the current economic crisis in Russia. 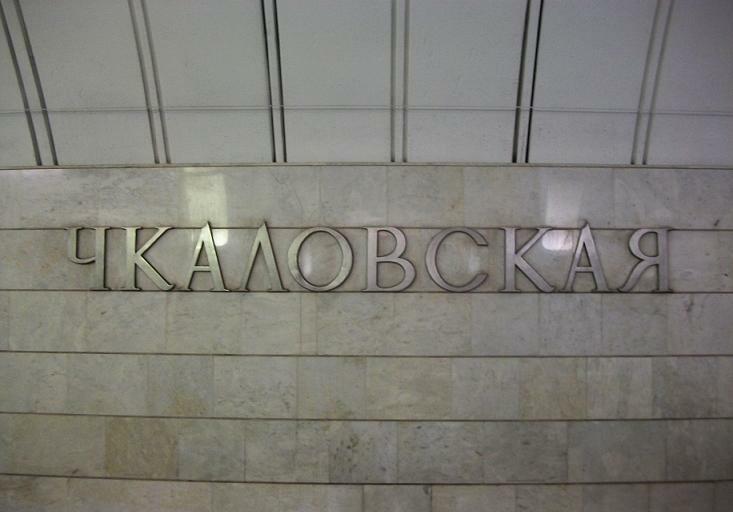 The standard large M denoting a Metro station, this one at Metro Kievskaya. 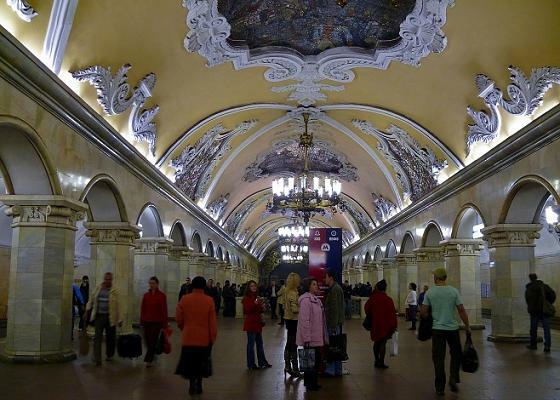 The famous Moscow Metro, known around the word for it’s vastness as well as it’s beauty. Nothing else, whether in New York or Paris or……can rival this magnificent transportation system. 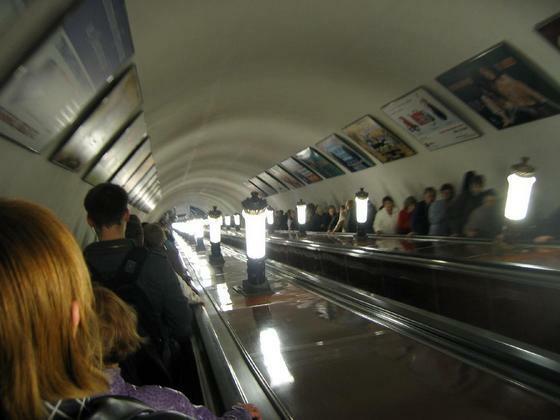 Americans, for example, are usually surprised at how the Moscow Metro outpaces the New York subway in daily ridership, number of stations, and extent of the system. Sometimes you’ll enter thru glass doors (very heavy so watch out!) and enter a hallway with turnstiles, and other times you’ll descend from street level thru a walkway before entering the station. Many Metro entrances are street level and you’ll enter thru large and very heavy doors, as seen below at the entrance to Metro station Arbatskaya. 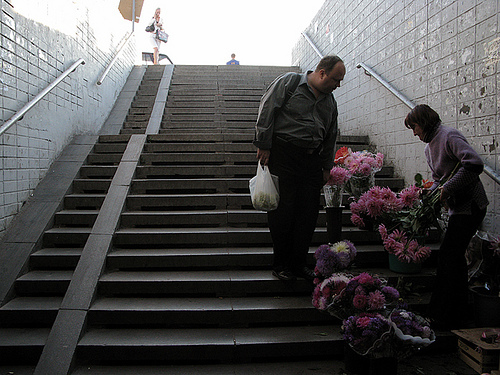 Next, see the narrow concrete tracks to the left of where the babushka is selling flowers? Those, sometimes concrete and sometimes metal, are the “wheel chair ramp. Wheel chair tracks on left, babushka selling flowers on right. Caution: it is easy to slip and fall on the wheelchair rails if not paying attention. Hopefully the worst of injuries will be bruised knees and ego. They’re especially tricky in winter, sometimes almost hidden under snow and ice. 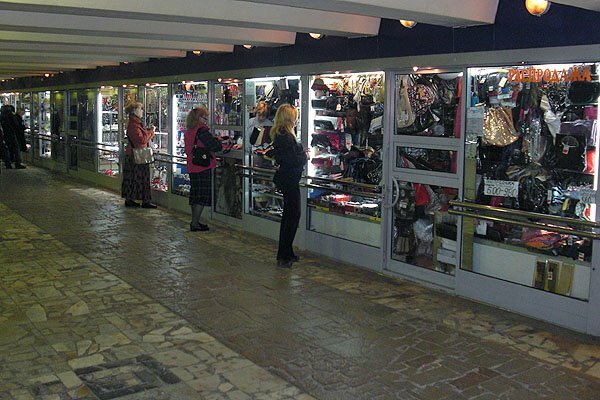 In an under the street entry like this, travelers quickly see underground kiosks in areas leading to cashiers and escalators. Items for sale vary from batteries to watches to perfumes to toothpaste to pantyhose and newspapers. Such kiosks are very small, allowing with just enough space for an attendant and the merchandise. Shopping is generally conducted through a sliding security window. 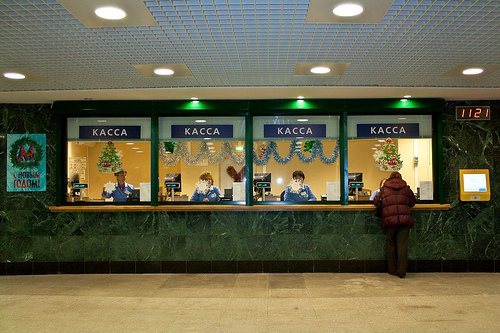 When you enter the Metro station Lobby you must stop to purchase a ticket. 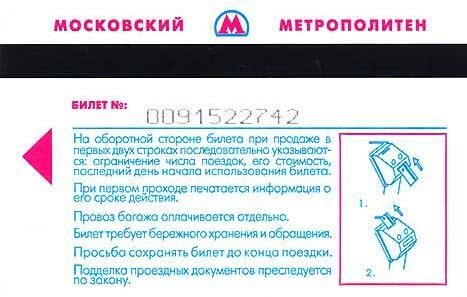 Metro card, remove top from insert. Insert your pass in the turnstile and it comes back to you. Follow the directions as shown below. On the older style machines follow the photo direction, right. For multiple trips ask about a smart card to swipe thru a sensor. You’ll need to take an escalator down to the subway platforms. It’s a steep ride so just hang on and relax. Coming off the escalator you’ll be at the platform areas. 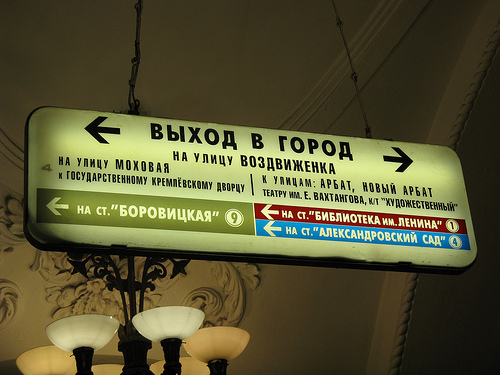 Take a Metro Map with both English and Russian to compare the station signs because no directions are posted in English. 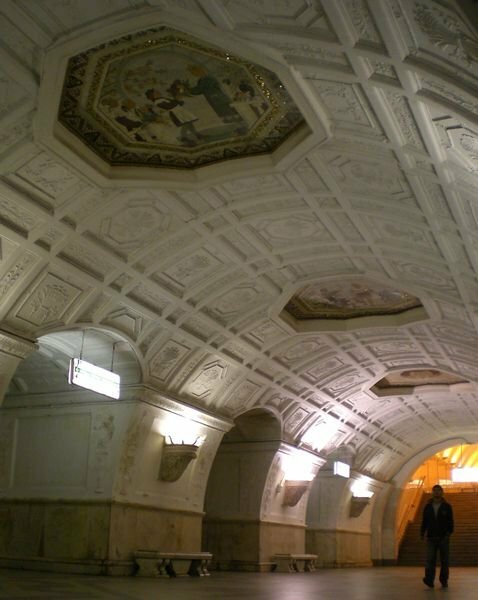 The Moscow Metro is not only the largest and second-busiest (Tokyo is first) in the world averaging 8-9 million passengers daily, but it is the most elegant and beautiful too. Metro Komsomolskaya is one of the oldest, and stunning. Station names are posted on the walls of each platform. 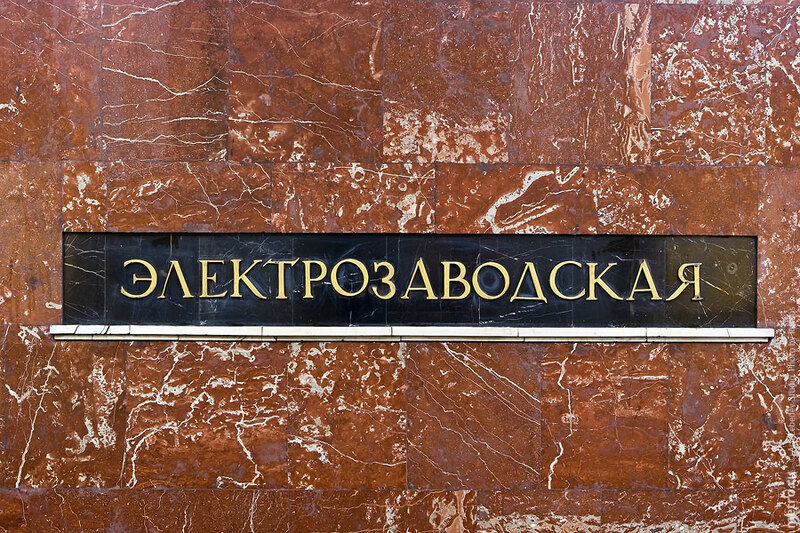 That is Russian Cyrillic for Metro station “Elektrozavodskaya”. So, with trains going each direction, how do you know if you’re riding toward your destination, or further away from it in the wrong direction. Again, your map in English/Russian is critical, but here is some additional help because let’s face it, it would be nice to know whether you’re coming or going! Easy. Just LISTEN. (http://mic-ro.com/metro/files/msk2-1.wav) On all lines you can determine the direction of the train by the gender of the announcer: on the ring line, a male voice indicates clockwise travel, and a female voice counter-clockwise. 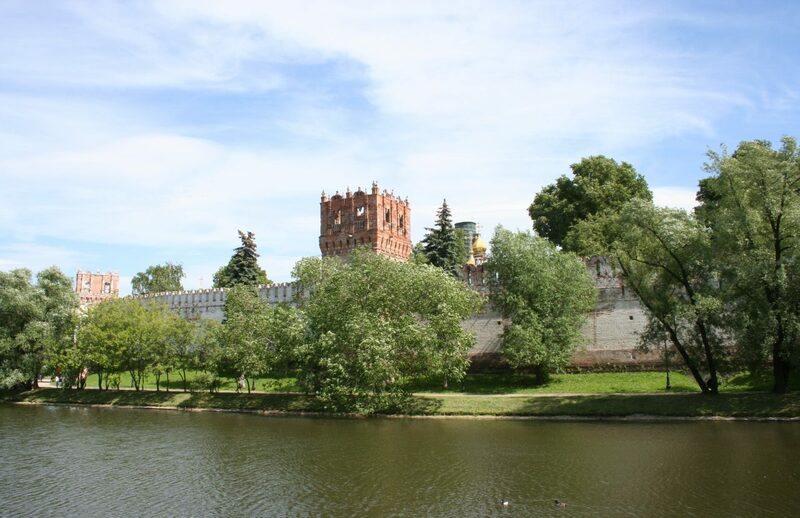 On the radial lines, travellers heading toward the centre of Moscow will hear male-voiced announcements, and travellers heading away from the centre of the city hear female-voiced announcements. How does one find the next stations down the line? 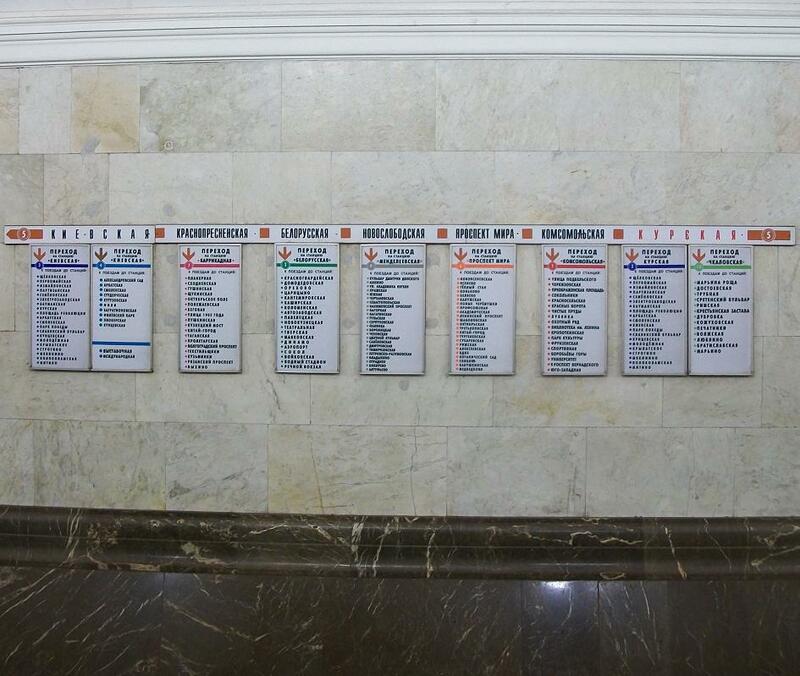 There are currently 11 lines with 180 stations so make sure to print one of the maps we’ve provided with both Russian and English lettering. Many of the Metro stops are transfer stations making it possible to connect with other lines. Along the top row are the next stations and underneath the transfer lines listed with the stations in each line. 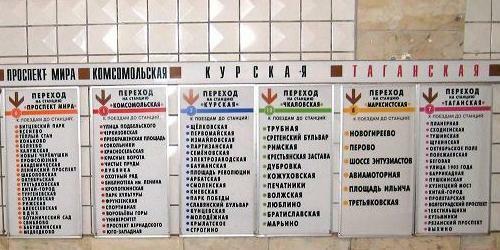 The red letters identify this Metro station as Таганская (Таganskaya). 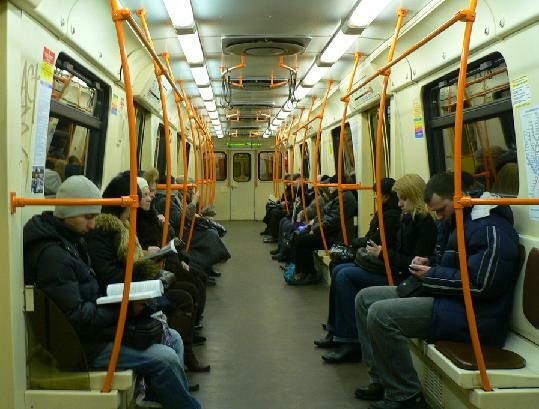 The Koltsevaya line (Circle Line, #5) is unlike other lines of Moscow Metro in that there are no stations which service the line exclusively; rather, all of the Circle Line stations are transfer stations linking passengers to other lines. The Metro is open from about 5:30 until 1:00 (the opening time may vary at different stations according to first train schedule but all stations close for entrance simultaneously at 1:00). During peak hours, trains run roughly every 90 seconds on most lines. Off peak hours run between 3.5 and 7 minutes. Each line is identified by a number, a name and a colour. The Metro has approximately 300 km of rail, 12 lines and 180 stations; on a normal weekday it carries 8 to 10 million passengers. Each day some 9915 trains operate between 5am – 1am. The (brown) Circle Line is number 5 and the most famous of the Metro lines. As that interactive map is flash based you can’t copy it. So here is a map to copy and print: http://coldstreams.com/pevesttales/uploaded_images/275px-Moscow_metro-709029.png With this map you should be able to click on the map and it enlarges for easier reading. It has the Cyrillic names in black and the Latin alphabet (English) names in grey. One of the famous stations near the Mendeleyev Journal is just up the line, Метро Чкаловская (Metro Chkalovskaya). The name is shared with a Moscow neighborhood (Чкаловской/Chkalovskoi) however the district isn’t near the Metro station. Метро Чкаловская was named for the after the famous Soviet aviator Валерий Павлович Чкалов (Valery Pavlovich Chkalov) who was a Red Army airforce test pilot and received the “Hero of the Soviet Union” award in 1936. In 1937 he successfully completed a 63-hour flight from Moscow to Vancouver, Washington (USA) via the North Pole flying a Tupolev ANT-25 plane. It was at least in part due to men like Chkalov who popularized the concept of Josef Stalin as “Father” to every Soviet citizen. In fact, Chkalov published an article titled “Our Father” about Stalin soon after becoming the first person to fly from Moscow to the United States. Valeriy Chkalov died in December of 1938, before the Great Patriotic War with Germany. The Metro station named in his honour is on the Lyublinskaya Line and is a transfer station to the Kurskaya-Koltsevaya and the Kurskaya-Radialnaya radial of the Arbatsko-Pokrovskaya Line. 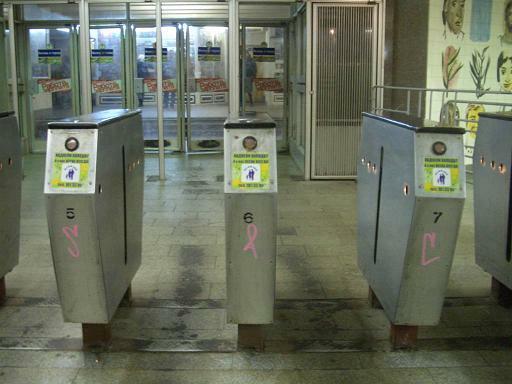 It also offers access to Moscow’s Kurskiy Rail Terminal. Most days the trains are crowded but this time there is a seat for everyone! 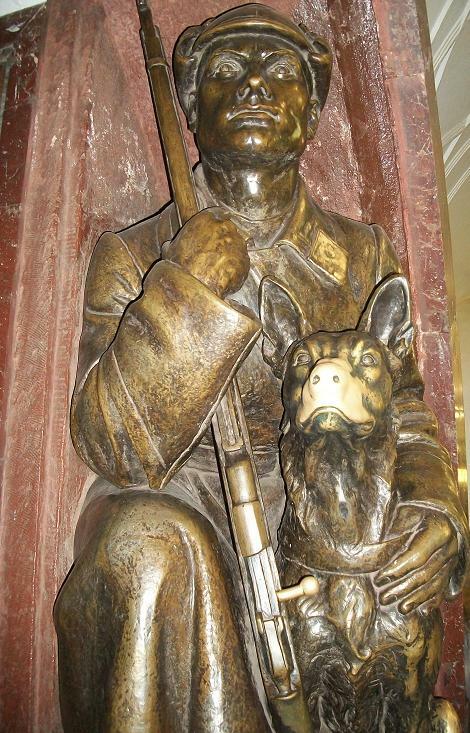 Moscovites believe that rubbing the dog’s nose brings good luck. While Moscow Metro subway trains mostly run underground, the Monorail is an elevated system, riding above city streets. With all those wires overhead, an electric троллейбус (t-r-o-l-l-e-y b-u-s) is quieter than a gas or diesel engine. However an electric engine does have sounds of its own. Come along for a ride and listen as each stop/street is announced along the way. Next let’s talk about those little taxi mini vans running all over most cities and towns. A town of any size will have taxi mini-vans (marshrutkas) which drive specific routes, generally starting at Metro stations. The price is the same for everyone so you won’t be gouged. They typically seat 10 to 12 riders and you can request a stop at any time. This would be the driver to show your written sign. Each van has its own route so watch the numbers on the side of the van and you’ll figure out the system in no time. Pay upon finding a seat by passing the fare from person to person up to the front. If your amount is wrong the other riders will tell you. Riders will often help you make correct change. The price is usually posted on the interior doors or windows. Sergei is pronouncing rubles as he imagines it should be spoken in the West, that is due to the letter “u” in the English translation of Rubles. In reality however, the Russian way of saying it is also correct in the West, “roo-ble.” Russian has a letter not found in English, Y which is spoken as “oo” as in the word Google. So Ruble is рубль or “Roo-ble” as in Google. More than one ruble is “roo-bley” for plural, рублей. 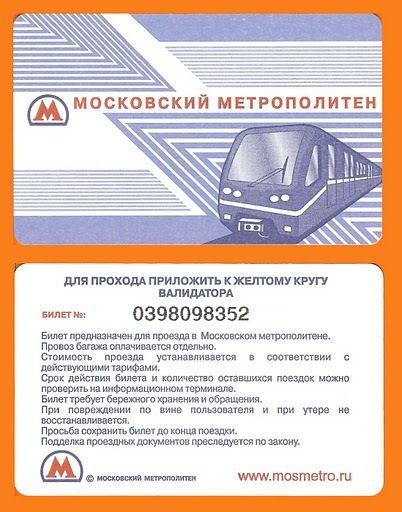 Most of the buses in Moscow can only be entered from the front and instead of a roving cashier on board who collects fares, a turnstile is installed near the front of the bus and you simply put in a ticket already purchased or buy one from the driver.